Despite the great strides that have been made towards global gender equality in recent years, the gap between men and women is still shockingly wide. As The Guardian reported last fall, it will take 81 years for the worldwide gender gap to close if progress continues at the current rate. As of last year, women had just 60 percent of the standing of men worldwide—taking into consideration factors such as female economic participation, education, health, and political involvement. While some countries, such as Iceland and Finland, have managed to significantly close their gender gaps, others are lagging behind. For instance, the UK has dropped six places on the WEF Global Gender Gap Index since the 2013 report, coming in 26th on the list of most gender equal societies. Meanwhile, in the US, women only earn about 78 cents to a man’s dollar—a number that is even lower for those females who are black or Latina, as reported by CNN. 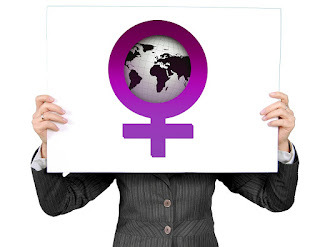 In order to effect change for women across the globe, many corporations and individuals are addressing gender inequality in various ways, whether it be within their own business or beyond the walls of the workplace. Here are several companies who are working to combat gender stereotypes by promoting equality through their products, wages, and initiatives. Founded in 2011 by fashion veteran Kate Pietrasik (who had previously designed for brands such as Hilfiger and Roxy), this company was born out of a direct response to gender stereotypes. Upon moving to England, Pietrasik was disappointed to find that any sort of fashionable children's clothing featured in stores was usually segregated by gender. Taking things into her own hands, she launched Tootsa, a brand that focuses on creating pieces that are “bright and cheerful and as colorful as a paintbox” rather than those that are geared toward only boys or girls. In the short time since its inception, the clothing company has expanded to include an adult collection as well. They now offer knitwear that can be worn at any age and by any gender. In 2004, the US investment company launched the Calvert Women’s Principles (CWP), the first global code of corporate conduct focused exclusively on empowering, advancing, and investing in women. Designed to provide companies with specific, measurable goals for achieving gender equality in areas such as pay, hiring, and career development, CWP offers corporations a set of standards against which they can assess and improve their performance toward women’s empowerment. Since its launch in September of 2011, the Think, Act, Report (TAR) campaign has garnered the support of over 140 major companies, including IBM, Tesco, BP, GlaxoSmithKline, and many more. Introduced by the UK government in order to help close the gender gap, the initiative encourages companies to think about gender equality, take action to promote opportunities in their workplaces, and report on what they are doing. Nearly half of the participating companies have completed an equal pay audit in the last year, and 66 percent are doing more to encourage female talent within their company. Such actions include introducing mentoring and sponsorship schemes, putting in place targeted development programs, and encouraging women to take high-profile jobs.